Bangladesh’s Mustafizur Rahman continued his amazing run of form as he bowled a sensational spell for Hyderabad Sunrisers against Kings XI Punjab in their Indian Premier League match on Saturday. The left-arm pacer has been very economical throughout the tournament but he took it to an extreme form in the match when he conceded just nine runs, the lowest from any bowler after completing full quota of four overs in this edition of IPL. Mustafiz, who also grabbed two wickets including the vital one of Shaun Marsh, surpassed Rising Pune Supergiants Rajat Bhatia who had a bowling figure of 4-1-10-1 against Mumbai Indians on April 9. 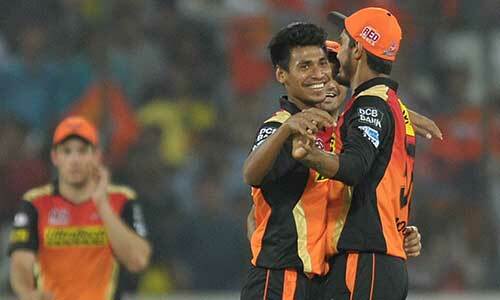 Mustafiz made a perfect start as he grabbed his first maiden over in his IPL career when he was introduced into the attack in the sixth over of the innings. Although he could not pick up a wicket but he gifted a maiden-wicket for his side as the pressure he created induced the run out of opener Manan Vora in that over. He continued his good work as he not only conceded just one run in his second over, the 14th of the innings, but also deceived Marsh, who scored highest 40 for his side, with his trade-mark cutter to trap himself for a leg-before. He beat the batsmen several times in his next over, the 16th of the innings and gave away just two runs. Hyderabad captain David Warner’s most potent weapon came to finish off the innings and he did not disappoint his captain he conceded just six runs with the wicket of Nikhil Naik. Thanks to Marsh’s 34-ball innings and a quick 36 not out off just 17 balls from Axar Patel helped Punjab scored 143-6. Sunriisers reached 146-5 in 17.5 overs to post their third successive wins. Sensational, by any standard !Young Mustafiz has made us all proud. I just wonder what Mr Sidhu going to say about such a fear: A fluke? I agree totally with Mr.Amin ,not only Mr.Sidhu also famous Kolkata actor Mr.Proshonjeet will say now.Well done Mustafiz may you have a long and healthy life. Mustafiz should not put his eyes or ears anywhere except stump in front. He should give 100% concentration to only bowling. We have all the best wishes for him.